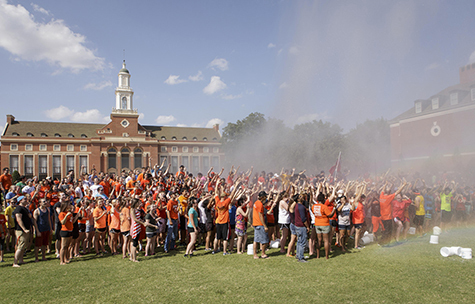 Following a challenge by President Burns Hargis and Coach Mike Gundy, the Oklahoma State University student body and Eskimo Joe’s founder and owner Stan Clark accepted the ALS Ice Bucket Challenge on Edmon Low Library Lawn on Aug. 21. With a shower of water from a the City of Stillwater fire truck hose, students showed their enthusiasm and raised more than $800 for the cause. The OSU student body then called out Florida State University student body. Chickasaw Nation Gov. Bill Anoatubby (left) poses with (moving right) former East Central University head football coach Hank Walbrick, current ECU head football coach Tim McCarty, former ECU head football coach Pat O’Neal and ECU President John R. Hargrave at the ECU Tiger 2014 Dinner and Live Auction recently in the ECU Foundation Hall of the Chickasaw Business and Conference Center. 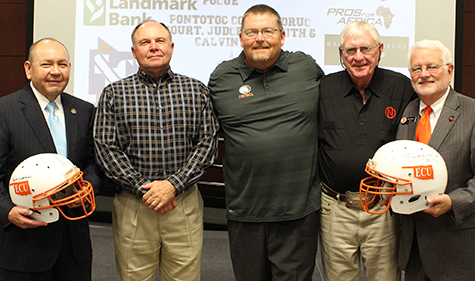 It was announced at the event that ECU’s football stadium will be named Koi Ishto Stadium. Koi Ishto means ‘Big Cat’ in the Chickasaw language. The stadium serves as the home for the Tigers and Ada High School Cougars. 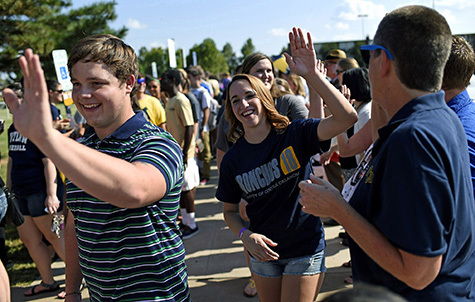 Incoming freshman students smile and high-five University of Central Oklahoma faculty and staff as they enter the university’s first-ever Freshman Convocation on Aug. 17, 2014. The event served as the official welcome for Central’s Class of 2018. Convocation began with a ceremonial walk through Central Gateway, the arch in front of Old North, to signify the start of the students’ journey at Central. Graduates traditionally pass through the gateway as they walk into commencement ceremonies. Students were addressed by UCO President Don Betz, Ph.D.; Provost John Barthell, Ph.D.; Vice President for Student Affairs Myron Pope, Ed.D. ; and UCO Student Association President Kiki Pierce.